﻿ 7 Emails Your Restaurant Should Be Sending » Red Mango Marketing! Four horrible words no one wants to hear at 5:30 pm when you have a “hangry” toddler and spouse. All I wanted was to make a quick and easy meal for dinner. It was 30 agonizing minutes to heat up the oven and food to just slightly warm, all before running out of patience. Looking back, it probably would have been quicker to just go to the restaurant just down the street. In the rush of it all, we didn’t think of that. Although, if that restaurant just a few blocks away would have already been on my mind, it may have been a different story. How can you make sure your restaurant is top-of-mind for the folks in your area? Email marketing can help you get in front of and engaged with customers on a consistent basis. Whether your current or potential customers are having a bad day like I was, or simply planning a meal out of the house, your restaurant should always be a top option. If you’re only sending emails when running a promotion, you’re missing out on the opportunity to get in front of people. You should be communicating with customers on a regular basis and including a variety of emails to be effective. It’s just as important to use email to share knowledge and expertise with your audience as it is to promote your restaurant. Try sharing information that helps your audience get to know you and want to support your restaurant. That way, when you do have a special promotion, they’ll be more attentive because you’ve built a relationship with them by providing value through email. It also means that your audience will be more likely to think about you in a pinch or when they’re planning a night out. Now that you know how sending a variety of different emails can help your audience stay engaged with your restaurant, how do you know what to send? We’ve come up with seven types of emails that you can add to your email schedule immediately. What happens when a new customer joins your email list? Depending on your normal email cadence, you don’t want people to sign up to your mailing list and sit stagnant in your database for weeks. That’s why it’s important to at least send an automated welcome email to thank them for joining and to let them know what to expect. Include information about the types of content they’ll be receiving and how often. Really focus on the benefits of being on your email list. If you entice subscribers to join your list with a coupon or a resource such as a recipe, it’s important to use a welcome email to fulfill the offer. Show that you’re a trustworthy business and provide what was promised. Continue the conversation with new subscribers by creating a full welcome series of emails that keep the momentum going. Automated birthday and anniversary emails can be a gold mine for a restaurant. It’s a great way to make people feel special and even entice people to join your list in the first place. Birthday emails can also be used for just about any type of restaurant. People want to feel like you’re paying attention and that you care. You could provide a discount or include a coupon for a free dessert on their next visit. As a restaurant, you want to let people know about any special events that are happening. Whether that’s a new menu tasting, a loyal customer networking event, or a holiday celebration, there are a variety of ways you can invite and remind people to attend. In addition to invites, use email to send save the dates and remind people to RSVP for your event. Email can also be used to follow-up after an event. Thank people for coming, and share images and videos of how great the event turned out! Creating dialogue through email generates engagement with your audience. Most people think that email is a one-way channel, however, by incorporating surveys and polls, you can learn from your subscribers. Learn about their experience at your restaurant, what kind of food they’d like to see on the menu, or even what they want to read about in your emails. Asking for reviews is also a great way to create dialogue from your emails, in turn generating awareness for new customers to find you. Ask your customers to share the details about their experience on your preferred review site. Be sure to include the direct link to your business listing in the email to make it as easy as possible. Humanizing your business is another great way to show your customers you care. You want to show the real people working behind-the-scenes. You could start by featuring employees and their positions at your restaurant. You can also share content in your emails about how you source ingredients, how a dish is made, or even how you’re making changes based on feedback from your customers. As I mentioned before, you want to provide helpful, valuable information that keeps your restaurant top-of-mind. This is where “how to” information comes into play. Share information that relates to cooking, baking, or even kitchen and dining decor. Think about sharing recipes, cooking tips, kitchen organization tips, or even decor ideas. This type of information will allow you to show your expertise and further keep your business on your contacts’ minds. Don’t forget, you don’t have to create or write all of this information yourself. You can save time by finding and sharing content to your audience. Another way to provide value is by sharing news. Whether it’s your own restaurant’s news, industry news, and even local happenings. Keep your contacts up-to-date on menu changes, new staff, or even feature popular menu items. In terms of local news, think about how you can show support for your community. Be sure to add your own commentary to let people know why they’ll find the information valuable. Email marketing is a valuable tool for any restaurant. Reach customers directly in their inbox and be there when they need you. Use email automation to save time and stay consistent with your cadence of regularly scheduled emails. When you send on a regular basis and include a variety of emails, not just promotions, you’re finding helpful ways to consistently stay in front of your audience. That way, your restaurant will be there whether they have a dinner emergency, or when they’re planning their next special event or celebration. 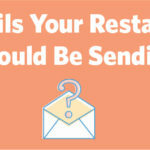 The post 7 Emails Your Restaurant Should Be Sending appeared first on Constant Contact Blogs. This entry was posted on Monday, April 15th, 2019 at 10:05 am	and is filed under Email Marketing, News & Updates. You can follow any responses to this entry through the RSS 2.0 feed. Both comments and pings are currently closed.